Dr. Jeffrey Chadwick, New Testament scholar at BYU has done a lot of research to identify when Jesus was born. He thinks Jesus was born December of 5 BC. How does he come to that conclusion? GT: I know you wrote a BYU Studies article about eight years ago, I think it was. Jeff: It was in 2010, December of 2010. The article appeared, dating the birth of Jesus Christ. So when was Jesus born? Well, [we ] have data that we have that are connected to what we call the Christmas story, both from the texts in Matthew, the texts in Luke, the associated texts in Josephus that talk about Herod the Great, and for us as Latter-day Saints, the Book of Mormon. All of the evidence put together from those texts suggest to me that Jesus was born late in the year 5 BC, actually in early winter of 5/4 BC. So for us, that essentially means December. In this first episode, we’ll dig deep into the census mentioned in Luke 2. Many scholars believe this census happened in 6 AD. How does Dr. Chadwick reconcile this? Jeff: King James is a translation of the Greek and it doesn’t say census there. It’s says enrollment. Let me just see, and pick it up there. But, the idea that is a census is something that has bounced around 20th century scholarship. But, I don’t feel that what was happening there was a census in the word that we’re used to it. GT: All the world should be taxed, right? Jeff: Taxed. It’s a taxing. This taxing first occurred, says Luke 2, when Cyrenius, or as we would call him, Quirinius, was the governor of Syria. Well, the word taxing here in your King James version, if you’re using a nice LDS edition, if you go down to the footnote, you will see that the word taxing is called enrollment. It’s not the word census that is used in that Greek alternative. It’s enrollment. And what this was in reality was a city register. If you’ve lived in America, you’ve never had to enroll. But if you go to any city in Europe, I served in Germany for example. If you move to a city, you have to register with the government for that city to let them know you’re moving there and will be a citizen. If you leave that city, you unregister and the new city you go to, you register it. And this is a European tradition that that comes clear from the Roman Empire. 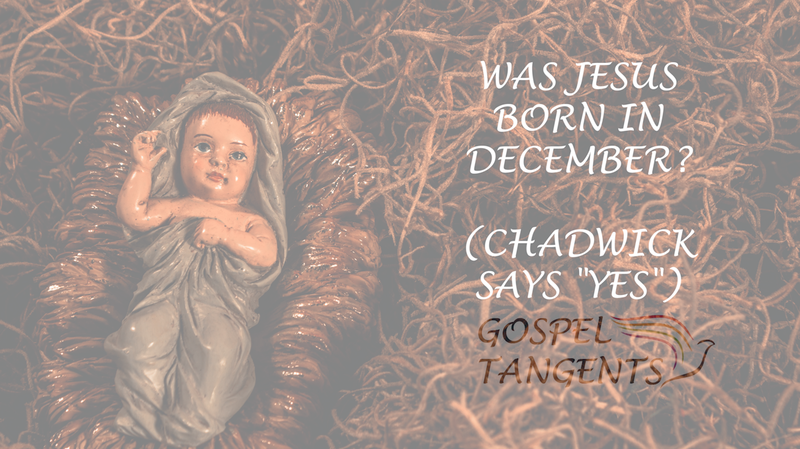 Dr. Jeffrey Chadwick believes Jesus born in December. If you would like a different perspective, see our previous interview with Dr. Thom Wayment. He doesn’t think the birth of Christ can be dated so precisely.